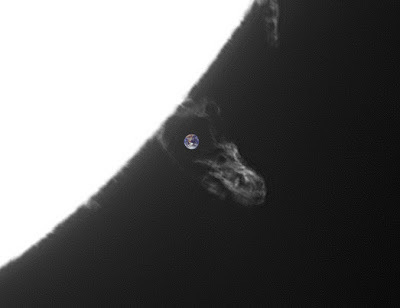 The distance of the outer edge of the prominence in this frame, from the limb of the Sun is about 64,400 miles. In the first frame of the sequence, the outer edge of the prominence was about 36,333 miles from the solar limb. In the last frame of the sequence, the outer edge of the prominence was at a distance of about 99,880 miles from the limb of the Sun. The outer edge of the prominence was therefore moving at an average speed of 16.3 miles per second.